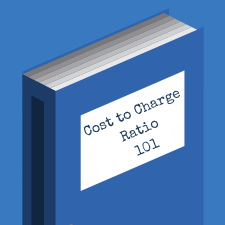 What is a hospital’s cost to charge ratio (CCR)? Here is a quick description of each of the cost to charge ratio components listed above. Billed Charges – These are the charges that the hospital will bill for each procedure it performs broken down by revenue codes. Revenue codes are codes that are universal in the healthcare industry and identifies for third-party payers where services were provided in the hospital. Allowed Amount – The allowed amount is the maximum amount a plan will pay for a covered healthcare service. Allowed amounts are also reduced by any patient portion (see below), if applicable. Contractual Amount – This is the difference between the billed charges and the allowed amount. The contractual amount is the amount the hospital must write off on their financial statements based on the contractual obligations they have negotiated with insurance companies or the Medicare/Medicaid payment schedules. Please keep in mind that uninsured patients typically do not have contractual amounts posted to their accounts. If the hospital has an Uncompensated Charity Care policy that allows for discounts based on levels of qualifications, those deductions will be posted instead. Patient Portion – The patient portion is the amount the patient is responsible for whether it be a deductible, co-pay and/or co-insurance. As stated above, any allowed amounts are reduced by patient portions. Hospital Costs – These are the costs that the hospital incurs to take care of their patients. These costs will vary from hospital to hospital depending on the types of services performed and the type of facility it is (i.e., teaching hospital, rural hospital, etc). The hospital costs on the cost report include direct patient care costs and also includes allocating overhead department cost to the routine, ancillary and non-reimbursable cost centers. By using statistical allocations from the hospital, the overhead department costs are split between all cost centers ensuring each cost center receives a portion of their cost where applicable.